Holidays bring such magic. I hope you're feeling it. Congratulations to Elizabeth Steinglass on the upcoming publication of her new book, Soccerverse (Wordsong 2019). She is graciously hosting our round-up this week at her blog. Thank you, Liz! 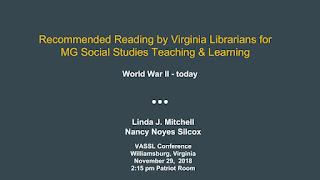 My presentation partner, author and librarian Nancy Silcox, and I presented Recommended Reading by Virginia Librarians for Middle Grade Social Studies 1865-present. 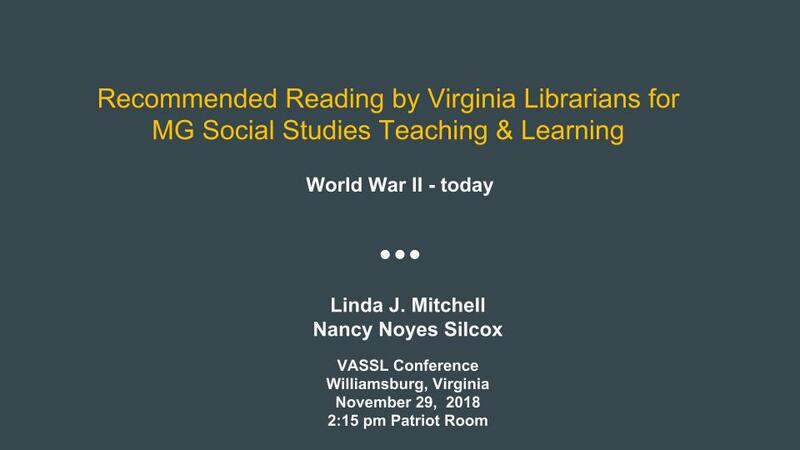 Nancy and I talked dozens of books that Teacher Librarians and Social Studies teachers can collaborate on...with. The following books in verse are included. *This book has content more mature than most for middle grade. It was presented as a book for teachers to read. It was a joy sharing the power of poetry to provide experience...to paint history in a way that students can understand. Poetry seems to be enjoying a moment in today's kidlit world--including education. Verse can absolutely do the heavy lifting of history learning. Spread the word! If there are titles you would like added to this bibliography for books in verse related to US History 1865-present click here. Thank you for including my verse novel THE TRIAL in this great list. I'm a huge fan of Marilyn Nelson (even took a workshop from her once here in PA) and I also love anything by Karen Hesse. Many other terrific authors and titles here, too. If you are adding to this list, my Knopf title RINGSIDE 1925: Views from the Scopes Trial would fall in this time frame and is also a novel in verse. As is KALEIDOSCOPE EYES (summer 1968, Vietnam, the Beatles, Janice Joplin, etc.) I'm going to add a few of these I haven't read to my holiday list! Thanks for the suggestions! It's super hard to be comprehensive. I knew I'd get more good ideas from the poets! I've read many and will continue to, Linda. Sounds like a wonderful time there. I always feel so FULL of inspiration after a conference. I'm reading Suzanne Slade's Countdown now, a look back in time for me & love it! And, it's old,but I would add Karen Hesse's Newbery winner, Out of The Dust. Thanks! This is such a great list! So helpful. I'm going to share. Great list, Linda! Thanks again for recommending COUNTDOWN to me. I loved it. A Wreath for Emmett Till is one of my all-time favorite. Marilyn Nelson is brilliant. Hi Linda! Thank for your kind invitation. I'm part of the Picture Book Builders blog with 7 other authors and illustrators. So I can join in for one of my posts if it's about children's poetry, correct? I appreciate your warm welcome! Thanks for this chock full of books post Linda! I've read many here and will look into more. "Enchanted Air" is wonderful as is "Brown Girl Dreaming, One Last Word, Josephine," and I really enjoyed Marilyn Nelson's "Carver: a life in poems," I felt like I was right there living his life with him via his plants and drawings. Great presentation, and so full of enticing options. I read KALEIDOSCOPE EYES by Jen Bryant--a great book with a powerful sense of setting, and I realize that your list is heavy on biography but it's not *uite clear which are the historical novels and which are the more nonfiction titles. What about BURN, BABY, BURN by Meg Medina? What a fabulous resource! I'm glad you advocated for historical fiction in the verse novel format! I am bookmarking this page, Linda, and thank you for it. I am working with a school district's humanities department so this will become an asset. Can you please send me the link to your presentation on WW11? I can't seem to find the link. Thanks.